Whenever the holidays come up, everybody thinks about traveling. So, if you're going to an English-speaking country, why not learn some important English terms and phrases first?! This course will teach you how to use English nouns and adjectives to describe things, and how to use positive and negative English words and phrases in a conversation. Make your next trip to an English-speaking country a lot easier, today! This English course will first introduce you to things and places that are associated with holidays and travel. You will learn different adjectives that will help you describe things easily. The course will introduce you to expressions that are commonly used to describe travel experiences. You will also study regular adjectives, comparatives, and superlatives such as tall, taller, and tallest as well as irregular adjectives such as bad, worse, worst. Next, you will learn why we use the word 'than' in comparative phrases such as 'I like coffee more than tea'. You will learn how to ask and give directions as well as study imperative English verbs and their correct usage. The course will also teach you why you should always use the article 'the' before superlatives such as the coldest, the biggest, the prettiest. The interactive learning content and audio recordings by native speakers included in this English grammar course will help you develop your reading and listening skills, load you up with new nouns and adjectives, and help get you ready for the holidays. If you're gearing up for your next trip to an English-speaking country, check out this course now and get ready for your next English adventure! Name the types of things and places we describe when on holiday. Include the different categories we use. Give examples of how we use adjectives to describe things. Read and listen to texts and audio and answer comprehension type questions. 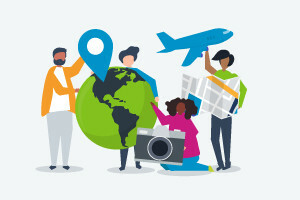 List some expressions we use to describe travel experiences. Illustrate the rules for spelling adjectives, comparatives and superlatives. Provide examples of irregular adjectives. Explain why we use the word 'than' in comparative phrases. Show your ability to ask for and give directions to places, in sentences. Define imperative verbs and show examples of how they are used.